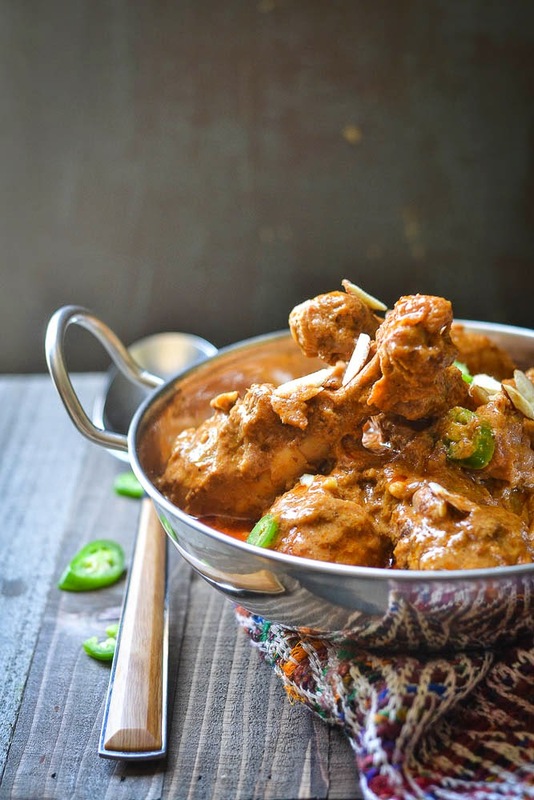 Today I'm going to share a chicken recipe which falls in the category of Indian Chicken Curry, has similarities with Sahi or korma Chicken as all of them have Mughlai influences. But particularly this one is not so rich or spicy, has a nice flavor of roasted whole spices, almonds and green hot peppers. Cilantro and roasted Almonds for garnishing . 1. Wash the chicken pieces. Pat dry with a paper towel. Add lemon juice, salt and red chili powder. Mix it well and rest for half an hour. 2. Whisk the yogurt with garam masala powder and add it to the marinated chicken. Toss well and give a nice coat on the chicken pieces. 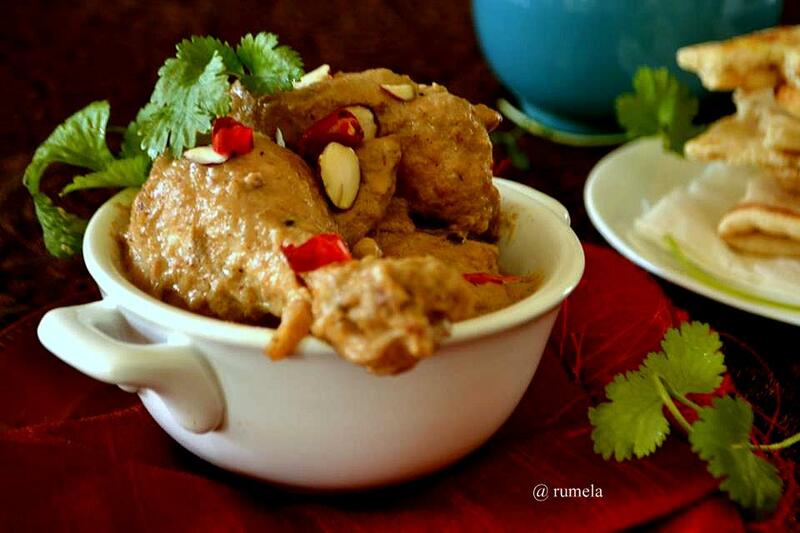 Place the marinated chicken into refrigerator for 2 to 3 hours, preferably over night. 3. Take a large pan with heavy bottom. Roast the whole spices. When nice aroma comes up, add oil and heat it up. Add bay leave, sliced onions, pinch of sugar and little salt. Fry at medium heat until they are soft and slightly brown. 4. Add ginger and garlic paste. Give a good stir for couple of minutes until raw smell goes away. 5. Remove the chicken pieces from the marinade and add them into the pan. Add salt and save the marinade. Now cook it well and give some good stirs. The color will soon change into light brown. Keep stirring to avoid burning at the bottom. 6. In the meantime, make a paste with the peeled almonds, milk, saved marinade and green hot peppers. 7. Now add the paste to the chicken. Let it cook for 5-7 minutes in between give some stirs . Add 1-2 cups of warm to hot water . Lower the gas and cover it. Cook until the chickens are soft or tender . Now you will see oils starting to come up from the side of pan. Check seasoning and add little sugar if you like. 10. Turn off the gas. 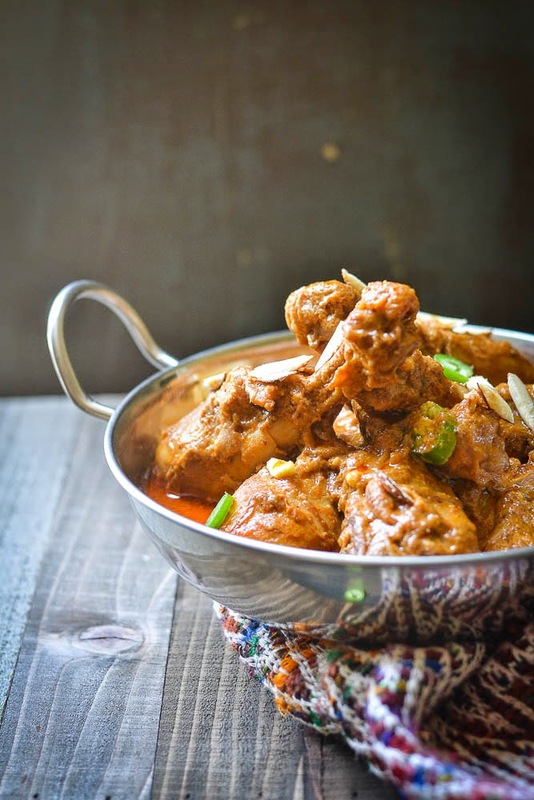 Murgh Badami is ready to serve !! Garnish it with some fresh cilantro and roasted sliced almonds. 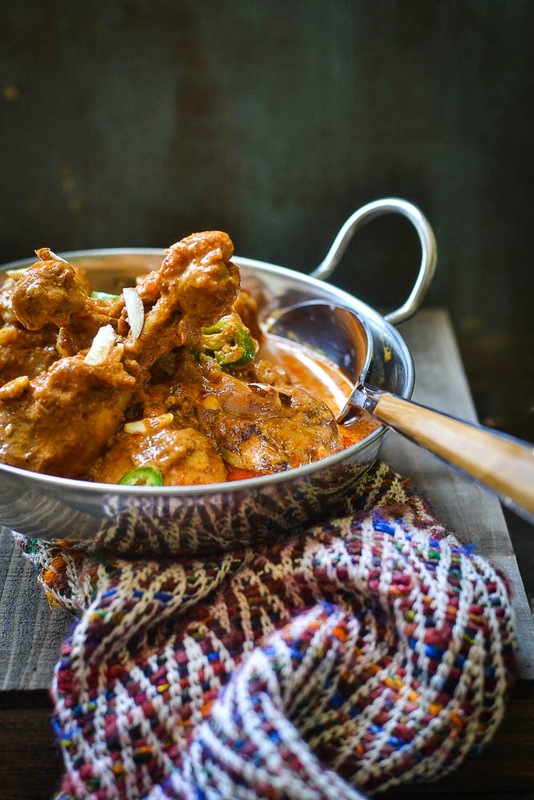 It goes well with all kinds of Naans or Indian flat bread or Pulao. 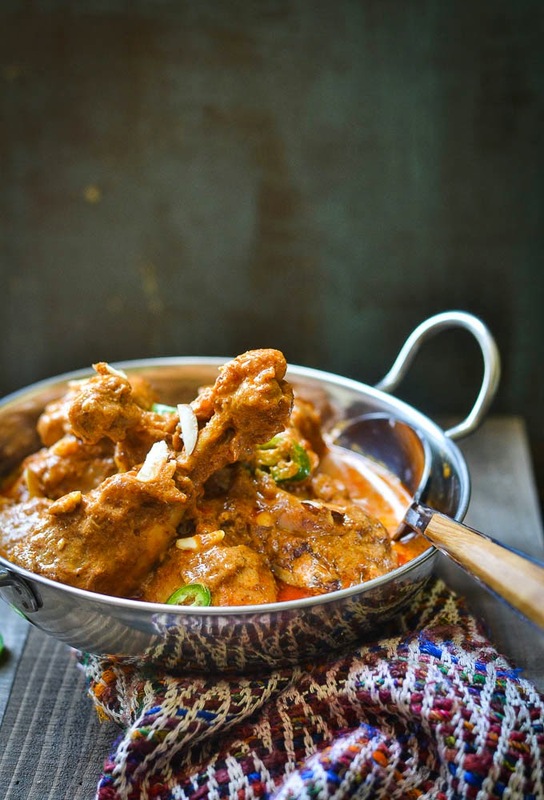 Note : To make it vegetarian dish, Paneer may be used in the place of chicken .When you add the chicken pieces or the marinade part, make sure they are in the room temperature and in the same time, lower the gas . It would help the yogurt from curdling.